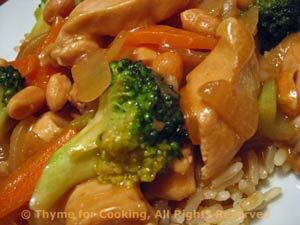 Thyme for Cooking Dinner tonight: Stir-Fried Chicken with Peanuts. Nuts and legumes are good for us, and I try to work them into the menus when I can. Besides, I love them. A bit of peanut butter adds to the flavor as well. Peanuts may not be as traditional with stir-fries as almonds or cashews, but they add a flavor a bit like sesame seeds, especially when combined with peanut butter - probably more Indian or Thai than Chinese. Cook rice for length of time on package. When done fluff with fork and serve. Cut the broccoli into small florets with a bit of stem. Cut celery into 1/4 inch slices. Cut the carrot into sticks 1/4 inch by 2 inch. Mince the garlic and the ginger. Dissolve the cornstarch in the soy sauce and set aside. In large skillet or wok heat half of both oils over medium-high heat. Add celery, onion, carrot and stir fry 3 minutes. Add garlic, ginger, broccoli and stir-fry 2 minutes more. Transfer vegetables to a plate. Add the rest of the oils to the skillet along with the chicken. Stir fry 3 minutes. Return the vegetables to the pan and add the chicken stock, sherry and peanut butter. Bring to a boil. Reduce heat, cover and simmer for 3 - 5 minutes longer, until the vegetables are just tender - but not over done. Give the cornstarch/soy sauce a stir to recombine and add it to the pan, stirring constantly until thickened.